By Zerkleinern, October 27, 2018 in Introduce Yourself! If all goes well, I will be attending the event in December. I plan on NPCing for all shifts. Currently, I spend my time crafting customer experience for a small firm that operates online with clients spread over the world (what I get paid for); parenting; and writing. 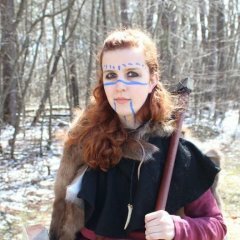 I moved to Ithaca 4 or so years ago and have yet to get plugged into a larp group. Previously, I resided in Columbus, Ohio. My background includes a mix of some combat and non-combat larps, theater, tabletop rpgs, video game rpgs, and a stint as the Artistic Director for the Medieval and Renaissance Performers Guild at The Ohio State University (stage combat, period costuming, song, dance, acting). Thank you for the time spent on and work put into the site, forum, and wiki. It is easy to get acquainted with expectations, rules, lore, etc. Your staff appears to be very knowledgeable, experienced, and attentive. One of my first considerations on whether or not I can play is scheduling. Can I make it there and back without taking up my entire weekend? (I have other responsibilities on weekends.) The location and on-the-day schedule were not easily on my path as a new person approaching the website. While rules, lore, general culture of players/community can be necessary to deciding if this group is a good fit for me — if I can't make it because the location is too far away or attending the entire event set up to tear down is required, then everything else doesn't matter. I met three friendly KoN folks at Wizarding Weekend 2017 in Ithaca. I don't remember their names but they were welcoming and enthusiastic. I kept the business card and looked yall up online. A year later, I've dedicated to try it out. I look forward to seeing how it goes and supporting a great game if only in a small way. Hello! I'm Maggie. I'm the Marketing and Player Outreach Marshal and I'm here to answer your questions. For scheduling, it's entirely possible to play the game while having your Sunday entirely open as the game ends at 1am on Saturday. While you are not required to be there for the entire game, for your first game at least, I recommend being there for at least shifts one and two. Shift one is from 9pm-2am Friday night. I start a New Player Orientation speech at 8:30 where I give a rundown of rules as well as answer questions. It's much easier for both of us if you can make it to that. Shift two is from 10am-3pm Saturday, Shift 3 is from 3pm-8pm, and Shift 4 is from 8pm-1am. Though you've already done a bit of reading, I'm still going to drop links to the Learn to Play section of the wiki and the World Book just in case. PS: Our crew is at Wizarding Weekend this weekend. I think there should be one or two familiar faces there. Let me know if anything is unclear or if you have any more questions. Welcome to Novitas! Maggie, thank you for added detail on the shift schedule! Oh dear! I hope they have hefty cloaks. We spent the whole day at the festival ducking in and out of stores trying not to get wet. I'll have to say hi if I see them tomorrow.